Hair thinning (reduced volume) is a gradual reduction in the diameter of individual hairs. It happens very slowly, and is not always accompanied by increased hair shedding, which means it can be hard to spot in the early stages. It is estimated that at least 15% of the volume is lost before reduced volume becomes apparent. If you are uncertain as to whether you are simply losing excessive amounts of hair, or if it is thinning, please click here. Hair thinning can be caused by a number of factors, the most common being ‘androgenic thinning’. Androgenic thinning is related, as the name implies, to androgens (male hormones) and is genetically predetermined. 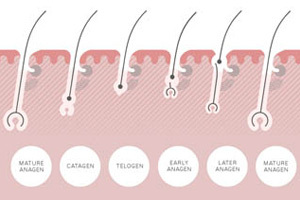 With androgenic thinning, the growth (anagen) phase of your hair cycle becomes shorter and shorter, and the hair also grows back progressively finer (thinner in diameter). Androgenic hair thinning is usually more common, and also more noticeable, in men than women due to higher levels of circulating male hormones, the pattern of loss can also be different. However, genetic hair thinning is not only related to how high your male hormone levels are, but also to how sensitive your follicles are to them. For instance, even sub-normal amounts of androgens in women can cause thinning if they are very sensitive to them. Genetic hair thinning in women usually occurs pre or post menopause, but can also be present in younger women with high follicle sensitivity. Treatment of genetic hair thinning will always involve the use of hormones – either topically applied, and/or taken orally in the form of certain birth control pills. However, the latter is only applicable to females. While hair thinning cannot be treated by over-the-counter remedies, there are many products available that can give you the appearance of thicker hair. Colouring and bleaching your hair can also help give the illusion of having more volume as these processes plump the hair shaft. The closer your hair colour is to your scalp colour will also help, as it disguises the contrast between areas of uncovered scalp and hair. 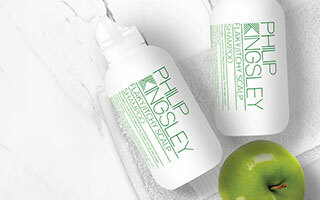 Our multi-award winning TRICHOTHERAPY® Regime has been created to help maintain optimum hair and scalp health from the inside out. Used in combination with a healthy diet and lifestyle, the 3-step holistic regime creates thicker, fuller hair and encourages healthy hair growth. A healthy diet and lifestyle always promotes healthy hair growth and optimum follicle function. This is especially important to address when excessive hair loss is also an issue, or, in fact, the only issue you are experiencing. A poor diet and nutritional deficiencies are one of the most common causes of hair loss we see. 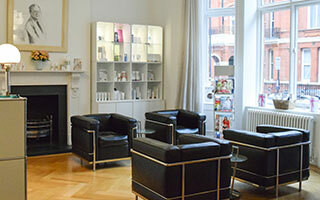 If you are suffering from thinning hair our clinics based in London and New York specialise in hair and scalp issues.